Left-Hander in London - The Earthquake is a show for everyone. This one-woman show tells the story of JJ’s journey from male to female, describes relationships lost and relationships changed and JJ shares her experiences of learning about diversity. In an instant, JJ changed almost everything. 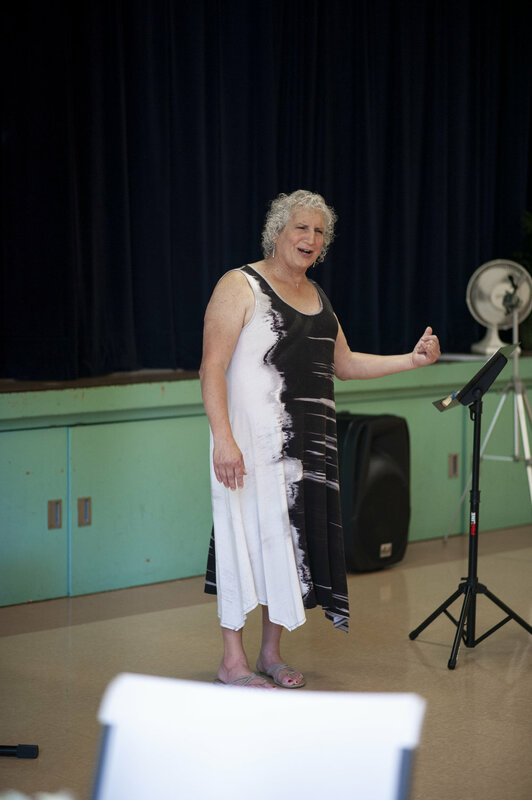 She had to share the news with everyone she knew, throw out her clothes and start over, and deal with all the changes as a result of the gender change, Through humor, song, and honest storytelling - this play creates a space in which no one feels defensive, and in which our shared humanity is celebrated. Join author and playwright JJ Marie Gufreda for a touching and funny performance of the experiences of one woman’s journey to Enjoy Diversity. as she shares stories and songs in her sarcastic and witty style. JJ helps us learn about how to improve relationships, live and work better together and to learn how to Enjoy Diversity, rather than feel the need to “understand” or judge. JJ shares that it doesn’t have to make sense for you to have empathy. Left-Hander in London explores this gray area and explores how you can appreciate and even enjoy a person that might be very different from you. If we are successful, the experience can bring us closer in our shared humanity. We may find that we are not that different. And when we are different, it can be an opportunity to learn and grow. 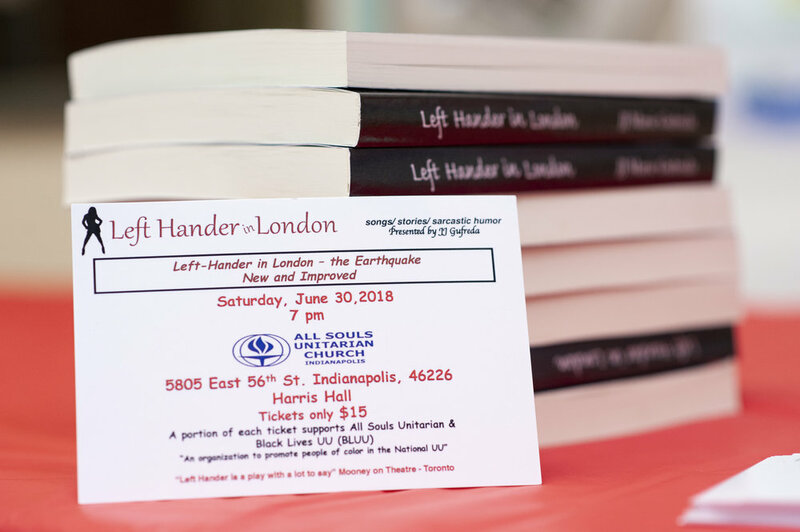 Left- Hander in London -The Earthquake, is a show that JJ created based on her book, “Left-Hander in London: A Field Guide to Transgenders, Lesbians, Gays and Bisexuals - In the Family, On the Job, and in the Pew”. As JJ shared in her book, unfortunately it is fairly common for people to lose relationships, jobs, friends and relatives almost instantly when sharing the news that they are LGBT - or that they are different from how people perceived they should be. Left-Hander in London was written to help people deal with diversity and show them how to consider how to build and improve relationships when change happens, rather than causing pain and ending relationships. JJ wrote the one-woman show, Left-Hander in London – The Earthquake to use her talents in working with groups, telling stories, helping people laugh, and writing and performing music to help people celebrate and enjoy diversity – in their daily lives, in their work and in society. If people can identify with JJ’s experiences, and laugh – at least a little, perhaps we can learn how to get along better. Who will benefit from the book and show? Family members and friends, and coworkers who have just received world-rocking news about a loved one’s gender identity or sexual orientation, or anything they consider as out of the ordinary or not expected. The show is 60 to 70 minutes long plus discussion time. Where do you perform the show? The show and associated consulting services (as needed) are appropriate as a stand-alone performance in a theater, as part of a consulting engagement, for groups and at schools, organizations and churches. What is the objective of the show? The show will entertain, facilitate discussion, improve understanding, raise questions, educate and help attendees Enjoy Diversity. You don’t have to come with or leave with a strong opinion or conclusion! If you leave with a song in your head and many questions, this is good! What would you suggest for people that attend your show? Listen, learn, share, participate and have fun. How many people can attend a show? As many as can fit in your space. Post show discussion is easier with smaller groups. An ideal group size for a show with discussion afterward would be 40 to 50 people. What kind of consulting services do you provide along with the show? In companies and organizations, the show can be used along with a Cultural, Operations and Diversity assessment, Facilitated discussions and follow up, with Vision and Plan development and roll-out. Is the show about transgender people? The show is about diversity, relationships, and working together. It is based on JJ’s experiences as a transgender woman, but is not specifically about transgender issues. Everyone. Some will be more comfortable than others, but hopefully, everyone will have an enjoyable time. Many of JJ’s experiences will be relevant to others. You are welcome to bring your opinions, preferences, beliefs and questions. What are some target groups that may be interested in Left-Hander in London? Companies where implementation of D&I initiatives has varied and patchy success. How does your show compare with a speech or presentation? I think the show is more entertaining and fun! JJ is happy to discuss any and all topics from from show with people. Discussion and participation are important outputs of the show. Hopefully humor and music will help JJ communicate well and help people feel comfortable and engage with each other and the show material. What kind of technical needs do you have to do the show? JJ needs to be able to be heard in the space, so requirements for microphones and a sound system would vary depending on the space. JJ has a keyboard and amps but if you can provide the instrument (keyboard or piano) and amplification, she won’t have to carry anything! Our company seeks diverse suppliers. Is your company a minority business? JJ’s company, GEI is certified as an LGBT Business Enterprise by the NGLCC. How are you qualified to do the show and associated consulting? I’ve been in consulting for over 30 years, I have lots of experience teaching and speaking with groups, I played piano in church for 30 years, and am very comfortable speaking with people about diversity and human interaction. I am OK with conflict. Why is Left-Hander in London needed now? Most companies and organizations have made the public commitment to embrace diversity in their customers, workforce and suppliers. Implementation of these ideals varies geographically, by the organization and within organizations. Problems arise when individuals do not agree with or accept the organizational commitment to diversity and inclusion. Ten or twenty years ago, companies might fire LGBT people when they discovered the truth about the employee. This caused some remaining employees to hide and suppress their true selves and cost the company because they had to replace experienced, productive workers that they had recruited, on-boarded and trained. Fortunately, this practice is becoming extinct because of organizational commitments to diversity and inclusion. Most companies and organizations now embrace and support LGBT people. A more recent and similar problem, however relates to workers that are not comfortable with the organizational position on diversity. If someone does not want to work with or associate with a certain minority or with LGBT people, their personal views are incongruous with acceptable behavior for the company. Discrimination is bad for business. If you are a worker that discriminates for any reason, eventually you will have to suppress or change your personal feelings to stay in the organization. It is important to support these people - either by helping them evolve their views, or at least by finding a balance where they can be comfortable in the environment at work. I am engaging, witty, sarcastic, conversational, and participative and I value the views and opinions of others. I also have a self-deprecating sense of humor!